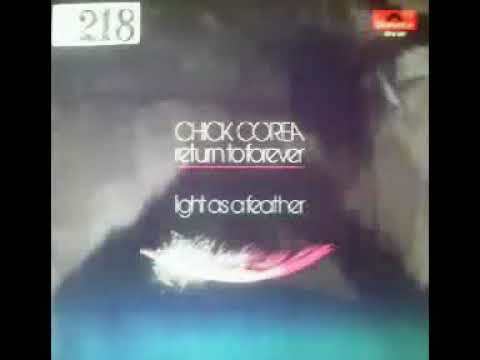 Return to Forever is a jazz fusion album by Chick Corea, simultaneously functioning as the debut album by the band of the same name. Unlike later albums by the group, it was released by the ECM label and produced by Manfred Eicher. The album was not released in the USA until 1975. The record is often considered one of the classic albums in electric jazz . At this stage, Corea’s approach to jazz fusion was very different compared to other early fusion artists. Adventurous electric piano solos are backed with South American oriented rhythms of drummer Airto Moreira and the vocals and percussion of his wife Flora Purim. Stanley Clarke is the bassist of the group (playing electric bass on A-side and double bass on B-side) and Joe Farrell plays flute and saxophone. This first line-up of Return to Forever consists of musicians (excluding Joe Farrell and Flora Purim) that were also playing on Stan Getz’s album Captain Marvel that was released in the same year. The first track can be divided into five parts. There are three short parts in which Corea plays simple, haunting melodies with Purim doubling them with her voice. Between these three parts, there are two longer parts in which the whole band plays. These main parts are both based on their own riffs. Farrell plays a flute solo over the first main part and Corea plays a solo over the second. Moreira’s drum pattern gives the composition an airy feeling of its own. Purim sings along with riffs, screaming a bit towards the end. The second track, “Crystal Silence”, is Corea’s song. The track is played just by Corea and Farrell with some soft percussion in the background. Farrell performs a long saxophone solo. Third track, “What Game Shall We Play Today?”, is another of Corea’s songs. It has a very affectionate melody and Purim singing vocals. Farrell is now playing the flute. Corea and Farrell give short solos between the second and the third verse. The band would return to this song during the Light as a Feather sessions later in 1972 when they made four attempts with it; though the song did not make it to the album, all the takes appeared on the expanded edition of Light as a Feather. The B-side of the album has only one track which consists of three different pieces of music. Probably they have been recorded without breaks and this is the main reason why they are not separated on three individual tracks; the bass lines skilfully link them together as well. The first seven minutes of the track consist of an improvised introduction featuring Corea, Farrell and Clarke, slow-paced and feeling akin to a Chinese landscape painting. As this section closes the piece moves into “Sometime Ago”. It is a Latin-flavored song with Purim’s vocals and Farrell soloing on flute. After that song, Farrell switches to soprano saxophone and the band plays “La Fiesta”, one of Corea’s jazz standards. Corea has written that most Spanish songs deal with matters such as misery or torture but “La Fiesta”, however, is about celebration. The song is an instrumental piece that relies on flamenco modes ((Wikipedia). The legendary first lineup of Chick Corea’s fusion band Return to Forever debuted on this classic album (titled after the group but credited to Corea), featuring Joe Farrell on soprano sax and flute, the Brazilian team of vocalist Flora Purim and drummer/percussionist Airto Moreira, and electric bass whiz Stanley Clarke. It wasn’t actually released in the U.S. until 1975, which was why the group’s second album, Light as a Feather, initially made the Return to Forever name. Nonetheless, Return to Forever is every bit as classic, using a similar blend of spacy electric-piano fusion and Brazilian and Latin rhythms. It’s all very warm, light, and airy, like a soft breeze on a tropical beach — hardly the sort of firebrand approach to fusion that Miles Davis, Tony Williams, and the Mahavishnu Orchestra were exploring, and far less rooted in funk or rock. Corea also bathes the album in an undertone of trippy mysticism, not only in the (admittedly dated) lyrics, but in his cosmic keyboard wanderings, which remain melodic and accessible through most of the record. There’s one genuine pop song in the groovy samba “What Game Shall We Play Today,” and while “Sometime Ago” has similar elements, it’s part of an ambitious side-long medley that features a stream-of-consciousness intro and a jubilant, Spanish/Mexican-style closing section called “La Fiesta,” complete with castanets and flamenco modes. The title track is another multi-sectioned work, featuring Corea and Purim in wordless unison on two different, catchy themes, plus breezy work from Farrell and lots of Brazilian-flavored rhythmic interplay. And the dreamy, meditative “Crystal Silence” is an underrated gem waiting to be rediscovered. Certainly, this edition of Return to Forever wasn’t inclined toward high-voltage jazz-rock (as the next one was), but this group’s two albums still stand as some of the most imaginative and distinctive early fusion recordings. All tracks are composed by Corea except where noted.